Music has a deep and universal impact on our psyche. The right song can unlock memories of long ago. It can soothe frayed nerves when we're stressed. Music helps us rally and brings us together in a way few other mediums can. Spiritual songs have the power to carry people through terrible times, and music is at the heart of worship in churches, temples, and mosques. Music can even be an excellent form of therapy. I have seen this in action. My highly spirited nine-year-old has known the power of music since her first days of kindergarten. Back then, she would come home exhausted, overstimulated, and – if I'm being honest – full of outrageous tantrums. Those were dark, shrill days in my parenting life. Then we discovered music. Now, even years later, she still spends her first half hour home at the end of her day alone in her room listening to a few favorite songs. When she emerges, she is calm and ready to chat. In spite all of its power, music has been absent from Doing Good Together's big-hearted offerings. Here are 5 projects for big-hearted music lovers. Do good, together, with the power of song. 1. Share your musical talent at a nursing home. Do you play the piano? Dance? Sing? Contact your local nursing home and bring your show on the road. Consider asking a few friends to join you and turn your act into a concert. Don't forget to leave time to visit and share a smile with the folks who come to listen. Check out our project instructions for conversation tips and book ideas for visiting the elderly. 2. Donate music on an unused MP3 player or iPod. For many living in nursing homes, accessing their favorite songs can seem too complicated. Make it easy for them! Do you have an unused MP3 player or iPod laying around? Load it up with music from decades past, package it up with a charger, and earbuds, and donate it to a local nursing home. Then, consider organizing an MP3 donation drive and inspire all of your friends to donate their own forgotten gadgets. This simple gift can have an immense impact on the health and well-being of others. Consider these 20 Surprising, Science-Backed Health Benefits of Music. 3. Raise money for a musical charity. Start a giving box, and dedicate your next month's collections to a music-based charity you love. I'm currently a huge fan of the work Little Kids Rock is doing, bringing engaging modern music and instruments to under-served school kids across the country. But really, there are so many incredible organizations working to provide comfort, inspire, and bring people together through music. 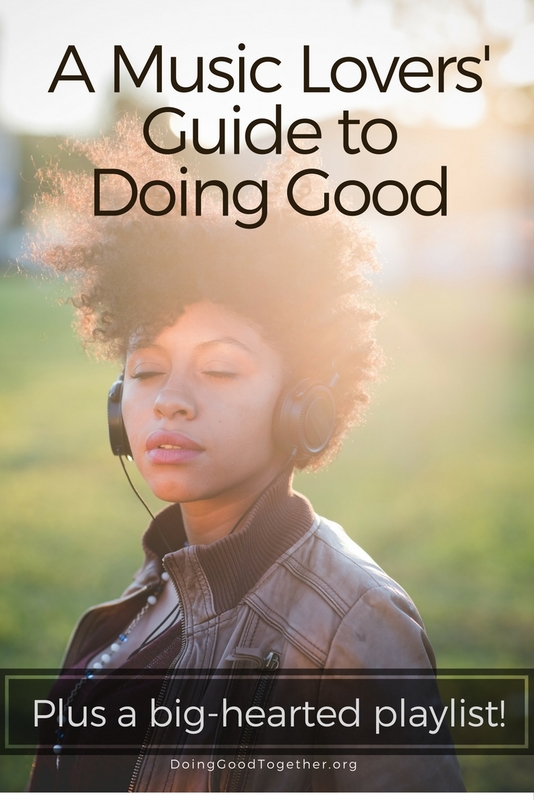 Check out this thoughtful list of Eight Nonprofits Changing the World with Music from The Hub. 4. Expand your musical horizons. Diversify your musical world by attending an unfamiliar cultural music concert. Take a dance lesson, sign up for lessons on new instrument. This small, fun family adventure may expand your understanding of the culture involved. You may even make a new friend or two. 5. Grow our big-hearted song list! First, listen to my new favorite by Jason Mraz. You can't help but smile when you hear it! Then, browse our Big-Hearted Families project collection, choose a favorite, and get started while you listen to our new big-hearted YouTube playlist! Click here to subscribe to this - and our other playlists - on Spotify. Find these songs and more in our YouTube collection of Songs to Fuel Kindness. We welcome your song suggestions or project ideas in the comments! Discover more tools to practice kindness!